1.5.7 英語放送スクリプト編: JR西日本・関空/紀州路快速 - dutcheez’s Fun with English! Thank you very much for using JR West. This is the Kansai Airport Rapid Service bound for Kansai Airport and Kishuji Rapid Service bound for Wakayama. We will soon be making a brief stop at Fukushima. After leaving Fukushima, we will be stopping at Nishikujo. Thank you. Attention please. We will soon be making a brief stop at Nishikujo. Passengers transferring to the JR Yumesaki Line, please change trains at Nishikujo. After leaving Nishikujo, we will be stopping at Bentencho. Thank you. Passengers transferring for JR Namba, please change trains at Shin Imamiya. Passengers transferring for Higashi Hagoromo, please change trains at Otori. Passengers transferring to the Osaka Loop Line and the Yamatoji Line, please change trains at Tennoji. Thank you very much for using JR West. This is the Kansai Airport Rapid Service bound for Kansai Airport and Kishuji Rapid Service bound for Wakayama. This train will be uncoupled at Hineno. Please check your car number displayed above the side doors, or on the digital displays. The first four cars, cars number 1 through 4 are bound for Kansai Airport. The last four cars, cars number 5 through 8 are bound for Wakayama. We will be stopping at Sakaishi, Mikunigaoka, Otori, Izumi Fuchu, Higashi Kishiwada, Kumatori, and Hineno stations. After leaving Hineno, the Kansai Airport Rapid Service will be stopping at Rinku Town. The Kishuji Rapid Service will be stopping at every station. Thank you. Attention please. We will soon be making a brief stop at Hineno. This train will be uncoupled here. Please check your car number. Car numbers are displayed above the side doors or on the digital displays. 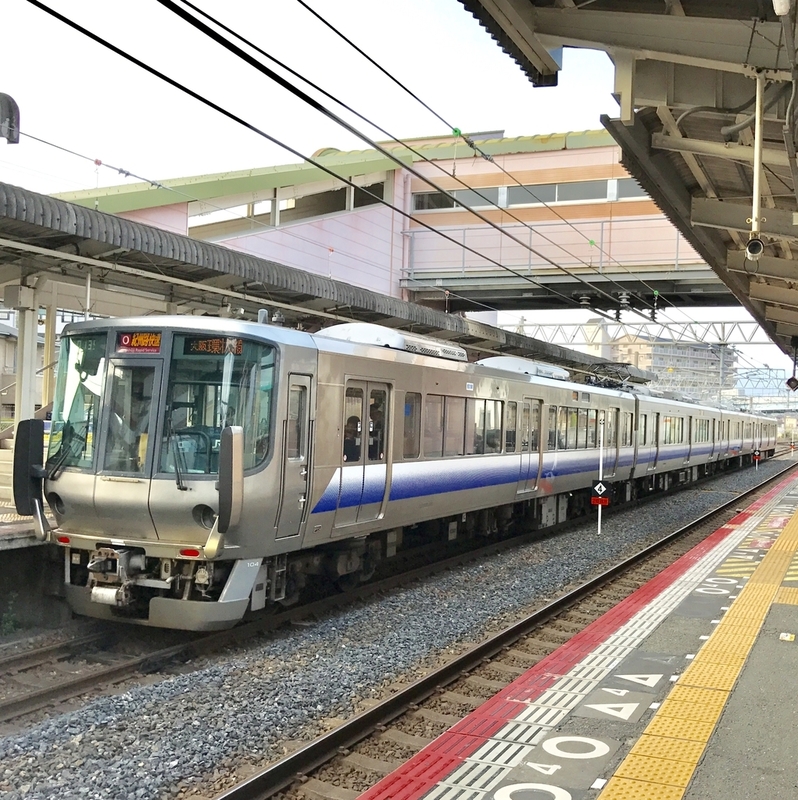 The first four cars, cars number 1 through 4 are bound for Kansai Airport, stopping at Rinku Town. The last four cars, cars number 5 through 8 are bound for Wakayama, and will not go to Kansai Airport. The Kishuji Rapid Service will be stopping at every station. Thank you. After leaving Rinku Town, we will soon be arriving at Kansai Airport terminal. Attention please. We will soon be arriving at Kansai Airport terminal. Thank you very much for using JR West.